Now that the weather has finally heated up and we are all basking in the dappling sunshine, thoughts turn to al fresco dining. There is something about eating outdoors, whether it be an impromptu barbeque or a planned picnic, fresh air and food just seem to go together so well. If you’re the type of person that loves to entertain then the warmer months are perfect for holding a summer garden party. But where do you start when it comes to planning? Follow our helpful guide and enjoy the best of the weather with delicious food and the perfect ambience. If you are organised and prepare your summer garden party you will have less stress on the actual day and will be able to enjoy the party much more. Start off with an idea of who you want to invite and what day the party is to be held. Then make a list of guests and send out invitations, marking off those who have responded that they are coming. Decide whether children are invited and if so will you have to order plastic beakers or glasses and paper plates? Think about ordering some outdoor games if there are going to be a few children turning up, this will prevent them from becoming bored. Once you have chosen a mood or theme for your party create a mood board and stick on material, ideas, colours, fabric, anything that gives you inspiration for the day. If there is a chance the party might go on into the evening think about hiring lights for when it gets dark. You can surprise your guests with LED lights or furniture, or drape fairy lights around trees and shrubs for a magical look. Decide whether you are going to prepare the food yourself or whether you are hiring caterers. If you are preparing then make a menu and then a list of what ingredients you require. See what dishes can be made in advance and what needs to be cooked on the day. Decide whether your party will have a theme and then you can plan with this in mind. So for example, a typical summer party could have bunting strewn around the garden with sandwiches and cakes and large pitchers of lemonade. A British theme could involve red, white and blue décor and Union Jack tablecloths, or how about an upper-class kind of affair with champagne and delicate canapes? If the occasion is in your garden why not take inspiration from the flowers and plants you have in place and compliment with matching coloured linen and centrepieces. If it is in a field then straw hay bales look natural and provide seating and somewhere to put down food and drink. 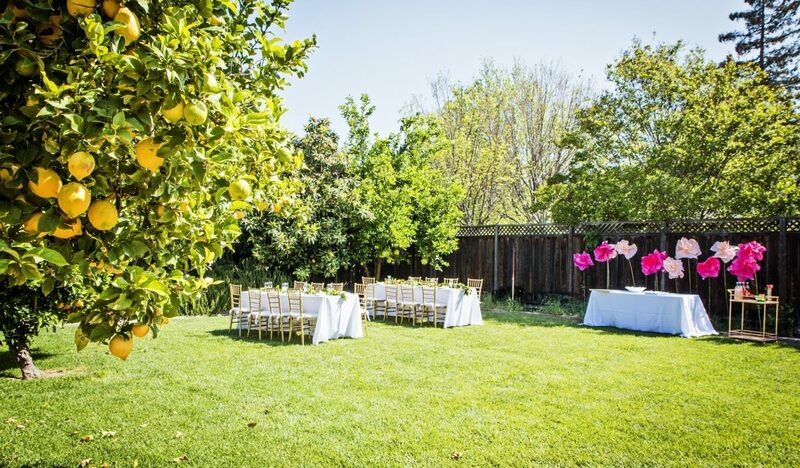 Choosing your venue, whether it be your back garden or a hired field is crucial to a successful party. You should take into account access for vehicles, how easy it is to set up tables and chairs, where the food is going to be stored or cooked. Will you need to order crockery, cutlery or glasses and decide whether a tent of marquee is necessary. As with any outside event, make sure you have an alternative plan if the weather doesn’t play ball. The main attraction of any summer garden party is undoubtedly the food and drink. Choose food that allows your guests to walk about and mingle so anything that they can carry easily is perfect. Think about the start of the party and whether you want to provide little nibbles such as olives, mixed nuts, vegetable crisps and bread sticks. Then decide whether you want to serve hot or cold food. Hot food is easily cooked on a barbeque and the smells whilst the food is cooking will tantalise your guests. Cold foods can be just as exciting, think cold fish platters or single serve prawn cocktails on ice. Cold meats that are sliced at the table and plenty of fresh salad. If you are hiring a bar make sure you have plenty of ice on hand, especially if the weather is hot. Have a mix of red and white wines and possibly one sparking. Put bottles of beer in buckets of ice and serve lime wedges on the bar to accompany them, and you can also provide a large punch bowl with or without alcohol for guests to help themselves. Don’t forget, if you need anything to make your summer garden party a success then contact Yahire and our dedicated customer service team will ensure you have everything you require.